View of part of the village of Ivybridge in Devon. Here there are some farm workers standing outside what may be a cluster of farm buildings. The village was centred around a small stone bridge over the River Erme. 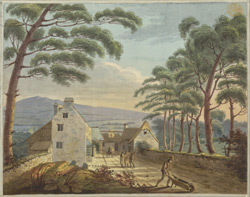 The village was along the road from Plymouth to Exeter and was a good place to stop for travellers. It was mainly an agricultural area, as shown in this print, although there were also a corn mill and paper mill by the river.